How to download and install Oracle Database 11g XE on my local computer to test ojdbc Oracle Driver? 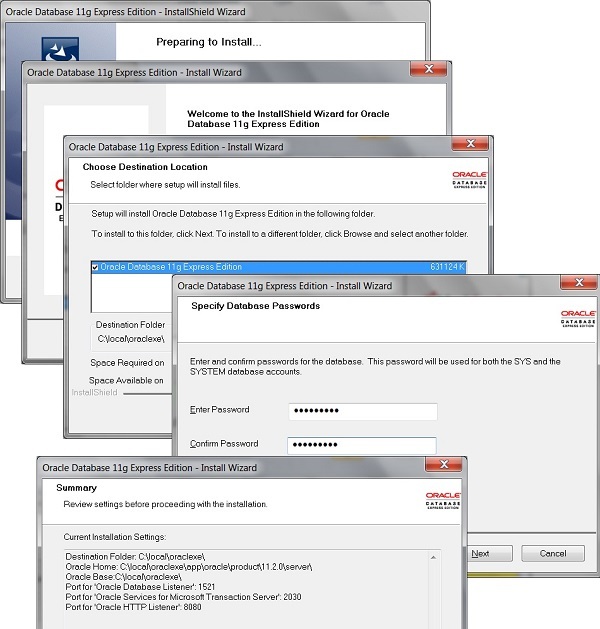 If you want to test ojdbc Oracle Driver and do not have any Oracle database to access, you can follow these steps to download and install Oracle Database 11g XE on your local computer. 1. Download Oracle Database 11g XE from Oracle Website. 4. Double-click "C:\fyicenter\OracleXE112_Win64\DISK1\setup.exe". You see the "Oracle Database 11g Express Edition - InstallShield Wizard" screen. 5. Follow instructions on the screen to choose destination location of \local\oraclexe folder. 6. Enter "fyicenter" as the password for SYS and SYSTEM accounts. 8. Click "Install" to finish the install, which may take a few minutes.